I’ve just got back from a lovely week staying on the banks of the River Otter, in my homeland of Devon. While I’m secretly a little disappointed not to see any of the river’s namesake (not that I expected to), I’m delighted that I got some glimpses of that jewel among British birds, the kingfisher. I’ve always found British kingfishers very elusive. While I’ve had good views of kingfishers in Africa and India, until a couple of years ago I’d never seen one in this country. Last week I was able to see a kingfisher several times. There’s something magical about seeing a flash of electric blue dart past. In my view they are the most beautiful birds this country is home to. It’s been my ambition to get a good photo of a kingfisher for years. Sadly the kingfishers were not very cooperative, preferring to perch in trees that still had plenty of leaves to obscure them. I didn’t have the patience (nor the thermal layers) to wait in the near freezing temperatures for the perfect shot. But I would love to return in spring, when they will be busy fishing to feed their young, and the weather might be slightly kinder to a keen but warmth-loving photographer. So, in the absence of a decent photo of a kingfisher by me, I can only suggest you have a look at these beautiful watercolour images of kingfishers by the wonderfully talented painter Jean Haines. Details of where you can see her work can be found on her website. We recently had to get a new fence put up. The old fence was very wildlife friendly. It was covered with ivy, which insects loved, and had convenient gaps for hedgehogs to get through. But it did lack certain qualities you’d look for in a fence (stability and verticality for a start). So anyway, something had to be done. I’ve talked about the problems of habitat fragmentation in a previous post, and this is just as much an issue for urban hedgehogs as for rural dormice. Our garden isn’t big enough to support a hedgehog (they can have very large territories), but is part of several hedgehog’s rounds. We wanted to make sure the hogs could still enjoy our garden (and we could still enjoy watching them). So when we got a few quotes we were careful to make sure that part of the specification was that it should have a hole in it that hedgehogs could get through. I felt a bit silly asking for a hedgehog hole, but the fencers took it in their stride (having previously had to do something similar for cats that refused to climb fences). So we now have a neat little hole for Erinaceous and friends. I was glad we had talked to them about hedgehogs, as when they were clearing our compost heap to put in a new fence post they came across a hibernating hedgehog. Luckily they realised what he was and put him safely in our hedgehog house without waking him. Hopefully the hedgehog won’t be too confused when he wakes up! Of course, the most wildlife friendly boundary we could have installed would have been a hedge with native fruit and nut trees. Sadly there wasn’t room for that. The new fence, while wonderfully vertical and stable, does look very bare without the ivy. I just need to plot out what to plant to make it a little more wildlife friendly. 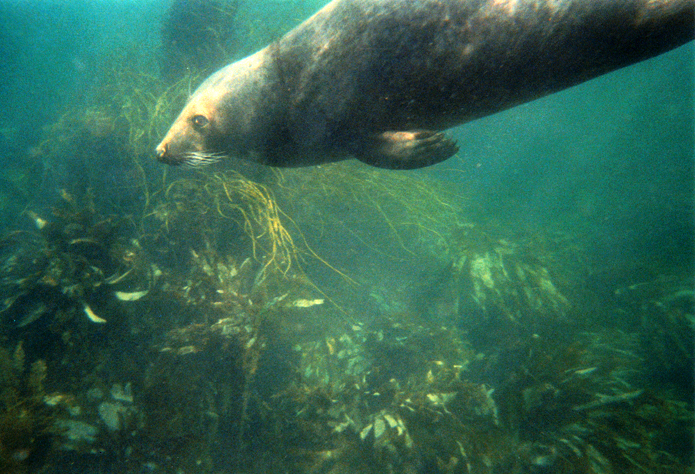 Half of the world’s population of grey seals are found around the coasts of Britain. Male house sparrow’s beaks are black during the breeding season, but turn yellow by the end of the breeding season. 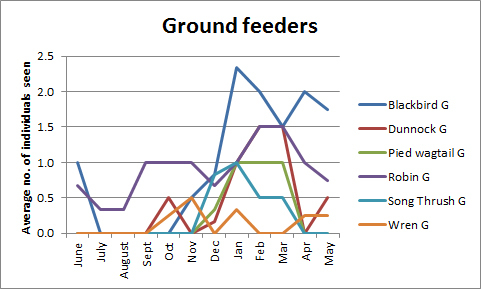 As I mentioned in my last bird nerd post, I have quite a lot of data on the birds that visit my garden, and am keen to hear ideas for questions I could look at with it. 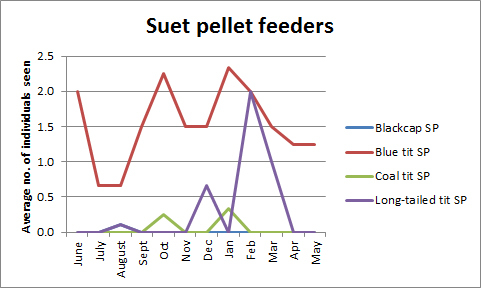 Someone suggested that it might be worth looking at whether birds with similar feeding habits have similar patterns of visits over the year. So I gave it a go. Of course there is a certain amount of overlap. For example, sparrows and bluetits will feed from both the seed feeder and suet pellet feeder, but do seem to have preferences. 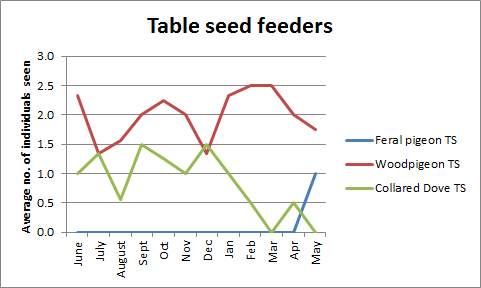 I then created some simple line charts, using the average number of each species seen per observation day for each month of the year, based on data from June 2012 – May 2013. Here are the charts. For most of them it looks like the average number seen per observation day is independent of feeding habits. 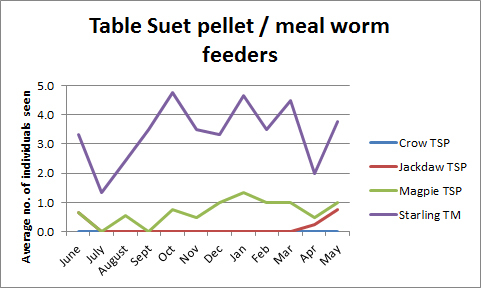 But there may be some relationship for those that feed from the ground or suet pellets or mealworms from the table. 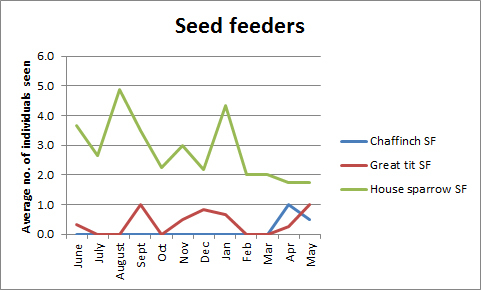 The patterns are unlikely to be driven by changes in the availability of food in my garden, as this is broadly steady throughout the year. However it could be linked to the availability of other food sources beyond my garden. It may be that birds in this category are more influenced by the weather than the other categories, so fluctuations are more in line with each other. It’s not conclusive evidence, but it’s an interesting hypothesis. When I have time I will use data from the whole 3 years to draw up scatter plots for pairs of birds whose average numbers seem correlated. Can you think of other ways I should test for a relationship? Are there any other questions you think I should look at? The wonderful Transition Dorking’s Golden Ticket event has got me thinking about Christmas shopping. Here’s a list of my top 10 present ideas for the wildlife enthusiast in your life. Some of them I already have, so can vouch for their brilliance. Others are things I’ve had an eye on for a while, hint, hint! 1) Swiss Army Champ knife: no nature explorer should be without a Swiss Army knife, and this one is all singing, all dancing. I’ve had mine for a couple of years, and can vouch for its robustness and versatility. My one has sawn off tree branches, cut wire to repair nest boxes, removed a tick from a dormouse, prised open paint tins, helped identify which small creatures have opened hazel nuts and performed numerous other essential tasks. My superhero name would be Swiss Army Wife. The only thing that could improve it would be a torch (which I’ve added to mine via the ring). It’s comforting knowing that, should I ever have to remove a stone from a horses hoof, I’m well equipped. Don’t just take my word for it – Simon King swears by his too! 2) Motion-triggered infrared trail camera – this one’s a bit pricier, but very exciting. We didn’t know we had hedgehogs or foxes visiting our garden until we got one of these. Most can be set to take stills or film, and should have a way of adjusting the focus. 3) Animal tracks kit – this is marketed as a stocking filler for kids, but who doesn’t secretly yearn to be a wildlife Sherlock Holmes? It’s on my Christmas list! 4) Camera bird box – give your loved one the tools to run their own Springwatch. We’ve been very impressed with the quality of the camera on ours, and while our bluetits have yet to get their youngsters as far as fledging, it’s still been fascinating to follow their progress each day. Plus when the nest box is not in use you can use the camera for other projects. 5) Mammal tunnel – more wildlife detective gear! Following on the theme of number 3, this simple set-up can help reveal which mammals make use of your garden. I think it would be a good project to do with a child (although don’t expect to find hedgehogs in winter!) or the young at heart. I enjoyed trying ours out, and if your loved one already has a bird box camera it can easily be rigged up (using gaffer tape) in the tunnel. 6) Paramo waterproof trousers – another expensive one, I’m afraid. But for anyone who spends a lot of time out in the Great British weather, these are an excellent choice. Not only do they keep the water out, but they are breathable and well ventilated, so you don’t end up with steamy legs. And they are comfortable enough to wear as normal trousers (rather than over-trousers), so you can just put them on before you set off, and not have to wrestle to get them on over your boots half way up a cliff when it starts raining. Having dry legs makes the outdoors a lot pleasanter on a rainy day. 7) Wildlife books – For the stormy days when not even good waterproofs are enough to persuade you away from the fire, a good selection of wildlife books is essential. General guides are useful for identifying animals, or working out where to see them. As a good, concise guide with plenty of pictures I would recommend the Collins Complete Guide to British Animals For a more weighty tome filled with high quality scholarship Mammals of the British Isles can’t be beaten. Hugh Warwick’s The Beauty in the Beast is an inspiring read, and the British Natural History series is good. On my Christmas list this year is Badgerlands by Patrick Barkham and the new edition of Otters by Paul Chanin. 8) Camera bird feeding station – If your loved one already has a bird box camera, this feeding station can make use of the camera when it’s not spring. I haven’t tried it, but it’s on my list. 9) A hand lens (or magnifying glass) – Hand lenses are very useful for examining things close up. It can help you distinguish what sort of mouse has been nibbling a nut, whose fur has been caught on barbed wire, and give you a better view into the world of insects. Another important tool in the wildlife detective’s kit. Just the pipe and deerstalker hat to go! 10) Courses – there’s so much to learn about wildlife, and good as books and films may be, they can’t rival getting out in the wild with an expert. I’ve been on lots run by Surrey Wildlife Trust and can recommend them. I’ve also had a couple of very enjoyable photography days at the British Wildlife Centre. Other Wildlife Trusts, the PTES, the Mammal Society and the Field Studies Council all run a selection as well – have a look to see if there are any that might inform and inspire your loved one. I hope this list provides a bit of inspiration. What would you have on your list of gift ideas for wildlife lovers? Being British I’m partial to a well kept lawn – I like playing croquet, and while I’ve yet to try bowls, I could see it being my sort of sport in a few years time. But while a lush carpet of green has it’s appeal, an untidy jumble of wildflowers is more my style, and requires a lot less effort than keeping the lawn perfect. Establishing a wildflower meadow is not just an aesthetic winner – having a variety of native flowers can attract lots of insects, while the seeds can attract birds like goldfinches. Having a variety of lengths of grass can provide shelter for a whole host of creatures. So when thinking about how to make our garden a wildlife haven, creating some kind of wildflower meadow was high up the list of things to do. Our garden is pretty small, with only around 5m by 4m of lawn in the first place. Since Dr C wouldn’t allow me to turn all of that into meadow, we settled on around half. We had a bit of a head start in creating a wildflower meadow as our lawn was not ‘perfect’ to start with. In summer there were buttercups (or a flower that looks like buttercups) that left to their own devices would happily take over. There were also (far too) many dandelions (although I’m not their biggest fan). So our first step was to let the grass and flowers grow uncut in that section of the garden, and let the buttercups expand. Wildflowers often prefer poor soils, so grasses don’t out compete them. For a small section of the mini meadow we took off a layer of turf, and sowed a mix of wildflower seeds. You can buy ready-mixed selections from any garden centre, which is what we did. But if you’re up for a bit more research you could investigate which wildflowers are found naturally in your local area, and choose a selection based on that. There are a number of specialist suppliers whose websites provide helpful information about the range of native wildflowers and how to establish a meadow. Being impatient (or as a kind of experiment, if you choose to put a more charitable interpretation on it), I also ordered a big batch of wildflower plug plants, and planted those in the rest of the meadow area. Not being an expert in flowers, I’m afraid I don’t know the names of all the flowers we have in the meadow. To my shame, I haven’t even counted how many different sorts. What I can say is there are quite a few different species, which means that as soon as one type stops flowering another takes over. It’s only in the last few weeks that we no longer have any flowers in bloom in the meadow. Encouragingly, this year we still have a good variety of wildflowers, despite not sowing or planting any new ones this year. Some of them are biennials that have survived from last year, while others seem to have seeded themselves from last year’s plants. The plants grown from seeds seem to have done better than the plug plants, although some of them are still around. Next year I might try and seed another patch with more different types, for even more variety. But hopefully the meadow will, with minimal maintenance, keep renewing itself each year. While digging up the turf and sowing / planting took a bit of work, the meadow is quite low maintenance (compared to a lawn). In the first year we had to water the new plants while they established themselves, but this year we haven’t had to do any watering, despite the dry summer. We ‘mow’ it with shears twice a year, and apart from that we leave it to its own devices. The insects seem to love it, and goldfinches have fed from the seeds of some of the flowers, which is very satisfying. It’s also nice to see the tunnel the hedgehogs have created through it. So if you’re looking for an excuse to be a lazy wildlife gardener, I would recommend creating a mini meadow. Maybe next year I’ll try and work out which flowers and creatures live in our mini meadow! 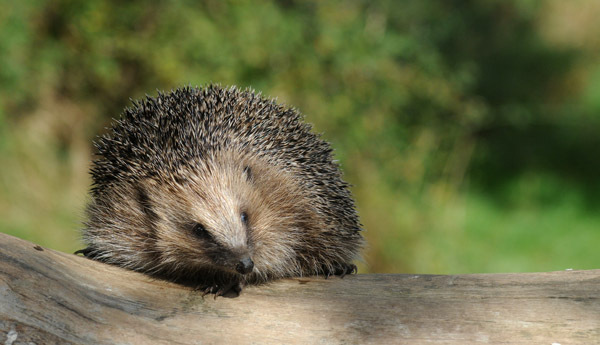 Piles of logs make an excellent home for many animals, including hedgehogs. They are a great way of attracting wildlife to your garden. Unfortunately, if you’re a hedgehog it’s rather difficult to distinguish between a nice safe log-pile to hibernate in, and one that is about to become a bonfire. If you’re having a bonfire this year, build it at the last minute or check it thoroughly before lighting to make sure no hedgehogs get a nasty surprise. And do consider creating a permanent log pile in a quiet corner.